The balcony of Cafe Istanbul will be dedicated as gallery space displaying the work of local painters and photographers on a monthly rotating basis. 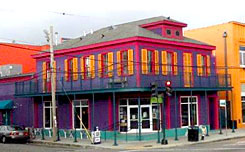 Café Istanbul will be a part of the St. Claude Arts District Gallery Openings that are scheduled for the second Saturday of every month. Meryt Harding, a local artist, has been hired to develop a roster of visual artists and curate the gallery space.